…We all Scream for Ice Cream! Today I made a new batch of this creamy, cold, sweet, wonderful stuff. Mainly I make the ice cream for Paul. He can afford to eat it – he never gains weight, he works off anything he consumes, but I get one or two small scoops of ice cream with each batch I make just so I’ll know how they came out. Tonight I’ll have some while our British DVD is on (we are currently into a series called “Between The Lines” which is an excellent older British TV series), however, I did already taste some of the spill-over ice cream and OMG! Guys! I found a new recipe! Above, it’s whirling around inside the ice cream making machine. It’s the easiest thing to do, I swear. So far I’ve made plain vanilla (good), strawberry (quite good) using both fresh and also frozen strawberries, oreo-cookie ice cream (very good, OMG-good), and lastly I’ve made three batches of coffee ice cream (incredibly good!). Paul just discovered that he loves coffee ice cream a couple of years ago, never having ever had a cuppa coffee in his life. He doesn’t drink hot beverages at all. 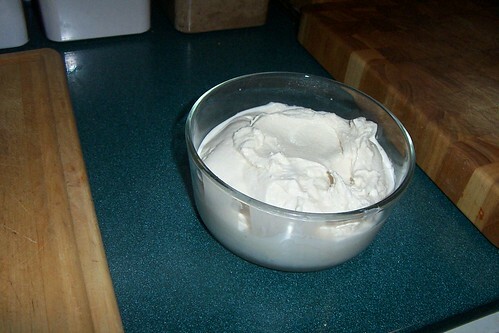 But that coffee ice cream he loved, so I made it with the standard vanilla recipe and just added about a half-cup of concentrated coffee that I’d made the night before and cooled in the frige. It was fabulously-good. 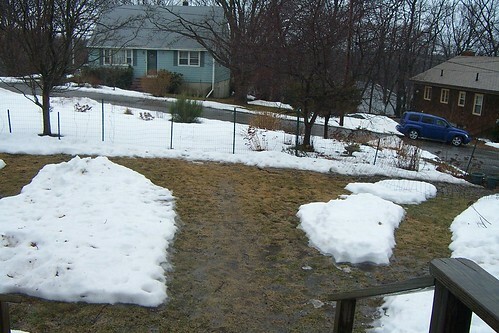 I had a brainstorm and wasn’t sure if it would work. I did not know what the outcome would be, either. I used BROWN SUGAR (LIGHT) instead of the one cup of white sugar it called for; I figured that would add a new flavor to it. And then I had the brilliant idea of adding some ORANGE EXTRACT along with the vanilla extract that it called for. I probably put in 2 TBS of the vanilla and 1 or 2 TBS of the orange… a little more than called for but wow… I have really stumbled upon something great there. I call this CREAMSICLE ICE CREAM. If any of you are over 50, you might remember Creamsicles on the Ice Cream Truck in the summers. This tastes just like one of those! OMG…I loved those things. Wow. Just changing 2 ingredients. I sure hope Paul likes the orange flavor in there now… fingers crossed! Happy Birthday to Sandra D.
I hear Sandra D. is not feeling too spiffy today, and we send our deepest wishes that she will improve from this recent set-back. Much love and hugs to Sandra and husband, Bill D.
I totally get Rhu’s sentiment about not wanting one of these machines because she could OD on ice cream. Yes, it’s very good, however, you don’t make a huge amount of it (#1), and it takes a little bit of time and effort to make rather than picking a box off a shelf in the store (#2), so when you go to have a serving, you don’t want to eat it all up fast so you tend to serve yourself just little spoon-scoops rather than big scoops… at least I find we are doing this. I only have about two large tablespoons of it in a small dish and then I eat it very slowly. Also, I am fiddling with the recipes and not using WHOLE milk (I use 1% milk), and not using all the HEAVY cream either, I only put in about 1/2 cup of the heavy cream and use half and half to make up the rest of the cream portion. You can apparently also use yogurt (I am going to try that soon), and soy milk for people who don’t eat dairy, OR try the Almond Milk – there are a lot of choices… some more healthy than others. I only made it strictly according to the recipe in the book the first two times and it was too rich for me to eat. Once I started thinning it down with 1% milk it was much better. I am NOT buying one of those things. I love ice cream so much, I’d OD on it for sure. The recipe sounds wonderful, though. I wonder if I can talk my friend A into making some for us to share. That ice cream sounds awfully good. I first heard that “I scream, you scream….” rhyme from my great aunt when my grandparents made ice cream. I think I already mentioned that commercial coffee ice cream is our favorite flavor. Odd since I can’t bear iced coffee. Now I could go for Fudgicle ice cream too! But Paul doesn’t like chocolate. I used instant regular coffee for the coffee ice cream, using 3 heaping tablespoons of coffee and about 1/2 cup of boiling water. 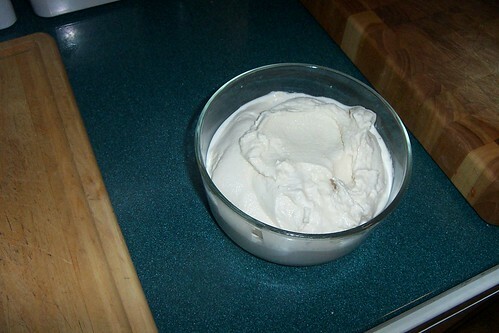 Just mixed that up and cooled it overnight before adding to regular vanilla recipe ice cream. Very simple and OMG, what a flavor! 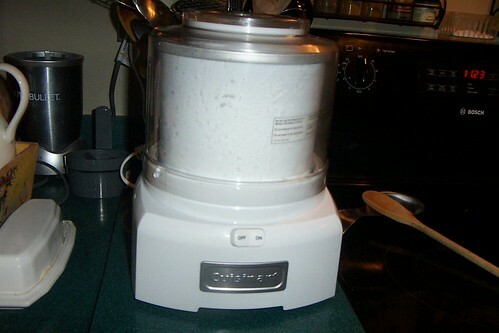 This is the ice cream maker I have, a reasonably priced machine for all the happiness and joy it provides! 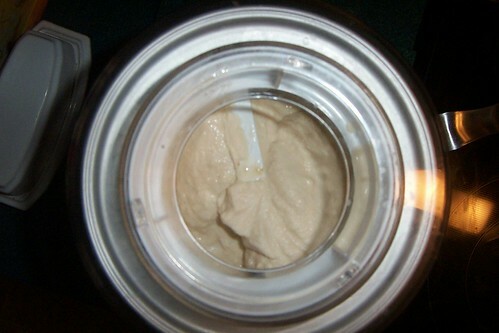 You can use freeze-dried instant coffee (better taste than regular instant) to make a good coffee ice cream. My husband used to say, it doesn’t taste like coffee, and I would reply, no, it tastes like coffee ice cream. My favorite. Back in the middle ages, my dad was a route salesman for Borden’s, which distributed the ‘sicles at that time. Popsicles, Creamsicles, sure, but I loved Fudgesicles. Haven’t thought about them in years. OMG, I love coffee ice cream. OMG…I am going to have to break down and buy one of those…I LOVE ANY FAVOR of icecream. I am sure this new one will be a hit…I am over 50 so i well remember that old favor.